A new report from VideoCardz has detailed AMD's upcoming Vega GPUs, with information allegedly originating from a leaked internal server roadmap, While reports like this should always be taken with a grain of salt, VideoCardz do have a decent track record with publishing early information. 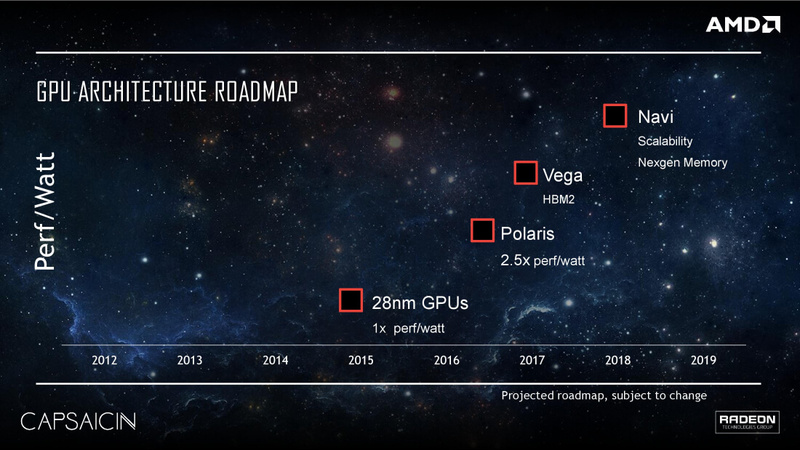 The leaked roadmap suggests that Vega 10, AMD's performance GPU set to compete with the likes of the Nvidia GeForce GTX 1080, is scheduled for launch in the first quarter of 2017. It will allegedly bring 64 compute units, which should total around 4,096 shader cores: the same amount as AMD's high-end Fiji GPU as seen in the Radeon R9 Fury X. The report also states that Vega 10 will come with a whopping 16 GB of HBM2 providing bandwidth of 512 GB/s, and will feature 24 TFLOPs of half-precision (16-bit) compute performance. Listing 16-bit performance is interesting considering we normally see standard 32-bit performance metrics, however the figures provided by VideoCardz do point to decent gains on the R9 Fury X. As for total board power, we're looking at around 225W from this 14nm part. The R9 Fury X had a rated TDP of 275W, so it looks like Vega 10 will provide a reduction in power consumption for an improvement in performance. However, depending on performance the card may still fall short of the GTX 1080's supreme power efficiency and 180W TDP. VideoCardz has also detailed Vega 20, which appears to be a 7nm die shrink of Vega 10. This GPU supposedly includes the same 64 compute units, however memory has been increased to 32 GB of HBM2 with 1 TB/s of bandwidth, along with a total board power rating of just 150W. Cards that use Vega 20 will support PCI Express 4.0. And finally, the report has briefly detailed three further GPUs: Vega 11, Navi 10, and Navi 11. Scheduled for release next year, Vega 11 will replace Polaris 10 in AMD's mid-range GPU line up. Navi 10 and 11 are future GPUs planned for release in 2019.